Andre Ward is a fighter who continues to surprise boxing fans and that’s exactly what he did on Saturday night when he stopped the formidable Sergey Kovalev at the Mandalay Bay in Las Vegas. The rematch was a horribly promoted affair and the number of fans on hand for the fight was probably more befitting of an amateur club show instead of an world title contest between two top pound-for-pound fighters, but the action in the ring made up for any lack of promotional nous. Kovalev, a man with imposing punching power, set about stalking his crafty opponent, while Ward was content to counter and get his work done on the inside. Much like their first clash, the fight was a highly competitive and intense chess match between two of the sport’s very best with some excellent exchanges and high drama. 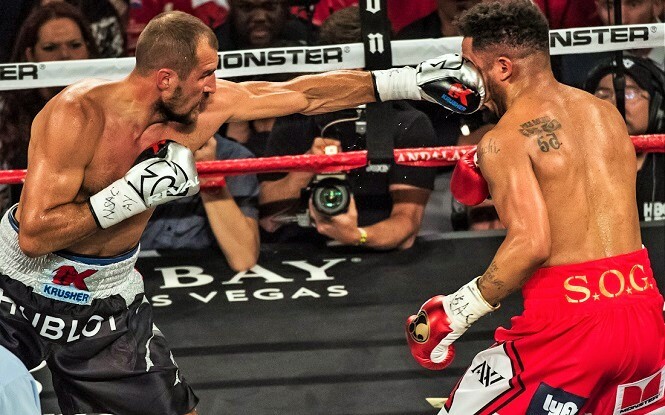 At times it was Ward who looked the better man, his elusiveness on full display as he ducked, weaved and countered Kovalev, but the Russian had his own success courtesy of his constant aggression and a piston like one-two combination. At the beginning of the eighth round it still looked to be either man’s fight, though Ward was starting to gain momentum while Kovalev likely deserved an edge on the scorecards. But unbeknownst to all, the end was near and it would be a controversial finish. 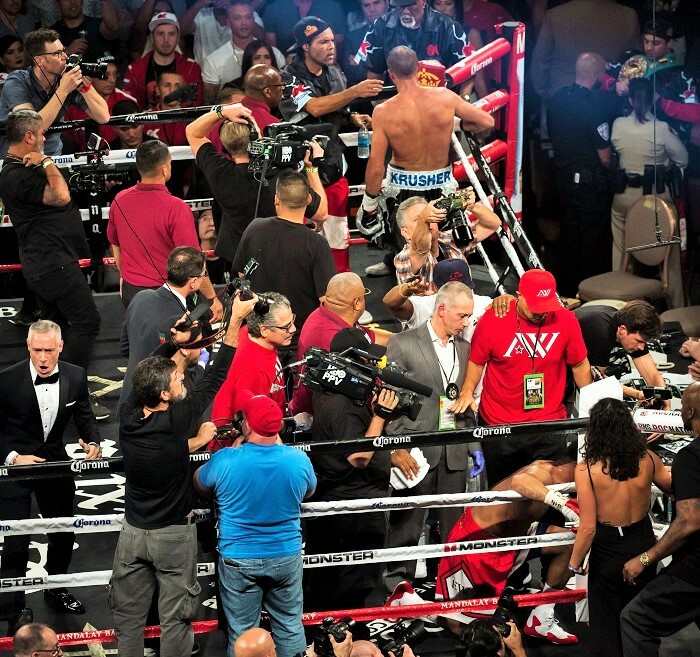 As a tired looking Kovalev rose from his stool to start the round, his fatigue was obvious for all to see. His punches lacked snap and his feet seemed to be slowing. Despite this, the challenger pressed ahead. 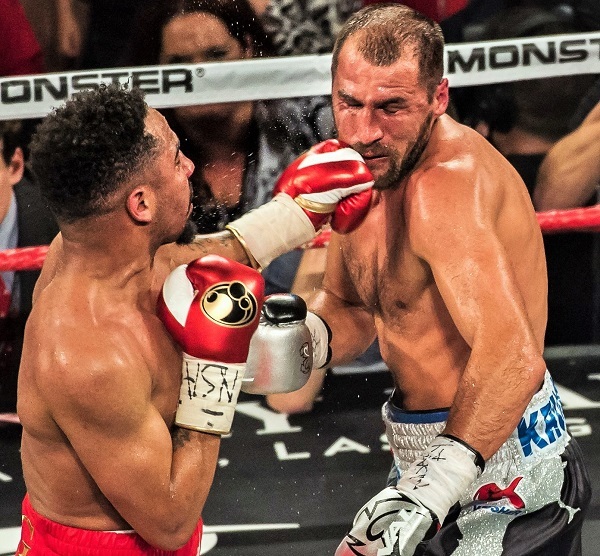 But now catching Ward would prove to be as hard as trying to hold smoke and when Kovalev threw a lazy jab in the middle of the round, Ward countered with a powerful right that landed flush on the jaw. That punch was the turning point of the fight. Kovalev’s legs buckled and he tried to clinch but Ward was determined to finish the job. He chased Kovalev around the ring, landing all manner of shots but it was the last few blows that caused the controversy. Fritzie Zivic, better known as the dirtiest champion in boxing history, once said that his best punch was “a left hook to the you-know-where,” and much like a prime Zivic, Ward landed what looked to be numerous low blows on Kovalev. When Sergey dropped his hands and stopped protecting himself, referee Tony Weeks waved it off. 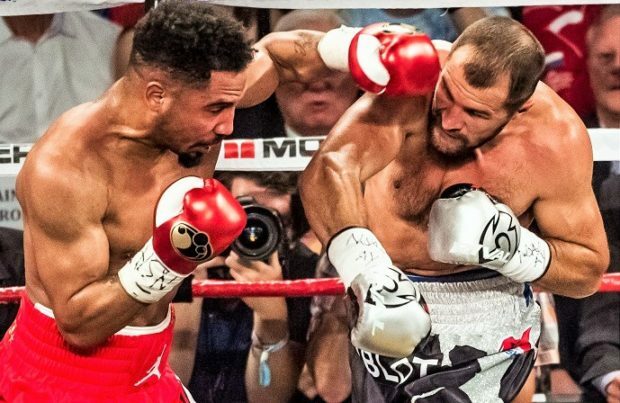 Kovalev is a proud man and the comments mirrored his disappointment but there’s no disputing the fact that Ward was gaining control and dominating just as the Russian began to fade. 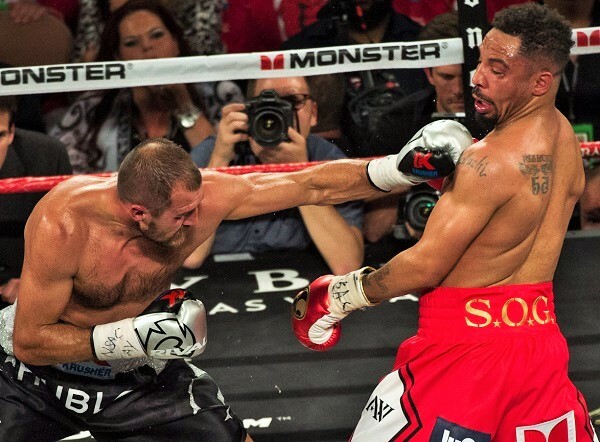 Despite the highly questionable stoppage, there’s little doubt that “S.O.G.” had Kovalev right where he wanted him after stunning him with that right hand. With the victory, Ward remains undefeated and solidifies his position as the pound-for-pound best fighter in the world. And in his post-fight interview with HBO’s Max Kellerman, he spoke of plans to move up in weight, again. It sounds ridiculous but then again nobody expected the man with the moniker “Son Of God” to actually defeat “Krusher” inside the distance and that’s exactly what happened. I, for one, wouldn’t rule out anything with a boxer as talented as Andre Ward. Whatever comes next, I’ll be watching with a keen eye. I’m a bit stunned it ended the way it did. When the first round concluded and Kovalev had landed a couple of very heavy body shots my initial thought was that if Sergey could continue to do that he’ll wear Ward down and stop him before the tenth. Unfortunately he just wasn’t very consistent in going to the body. Ward on the other hand seemed to have gotten Kovalev’s distance down better than in the first fight and was being pretty aggressive, at least by his standards. I know a lot is going to get made of the borderline low blows Andre landed in the 8th, but I think by then Kovalev had tired himself out by the fast pace, and that along with the big right hand that Ward landed flush at the 1:14 mark at least gave the appearance that Kovalev was badly hurt. So when I watched the replay of Ward ripping three body shots to Kovalev in the corner, one of which was certainly low I can’t really blame Tony Weeks for stopping the fight. The blows may have all been low, but Kovalev had the look of a beaten man, psychologically if not physically. I really wish the ending could have been cleaner because I do think Ward deserves more credit than he’s going to get from a lot of people. P.S. Can anyone confirm that Kovalev really was making zero dollars from the purse as opposed to Ward making 6.5 million? I just can’t see how that’s possible. How can Kovalev’s promoter allow him to be shortchanged like that? Boxing is so bizarre sometimes that I can’t believe it still exists. Ward makes a guarantee of 6.5 M plus other % from sales, and Kovalev only makes 75% of whaterever his side gets. He gets no guarantee though, and thats his managers and own promoters fault. Ward’s promoter on the other hand is gonna lose millions, just as he did for the first fight, but thats no problem for Jay-Z. He pays Andre millions just to watch him box basically. It’s not like the other promotions, even the huge ones like Golden Boy or Top Rank. Nobody does what Roc Nations does. The ref’s view wasn’t obstructed. Ward may have finished him shortly after anyway if the ref had pulled them apart or Kov may have soldiered on with a second wind. We’ll never know. I’ve seen a few replays and now I’m starting to feel like I’ve been hit down there too! On two other occasions during the fight Kovalev made the same mistake, waiting for the referree to intervene on what he thought were fouls and letting down his guard (or turning his back to Ward). On both occasions he was told to continue fighting. He should have known better on the third occasion and taken a knee instead of just sitting there getting pounded. The ending was a shame. Ward didn’t need that help, he was wining anyways and the Russian was tired. Altogether with the Rigo fight this was a bad night for boxing. Tony Weeks is a disgrace. All this talk about how Ward was going to win anyway is bull. It was a very close fight at the time of the low blows (nothing very borderline about them). A proper referee gives Ward a point deduction and recovery time for Kovalev. That could well have changed the outcome, but I guess we’ll never know. Thanks a lot, Tony.